What started as a sport to make time for family bonding resulted in a passion for senior Chelsea Morrow. Due to overlapping seasons, Morrow chose golf over tennis in seventh grade and has never looked back. After placing on the varsity roster Freshman year to now holding the number one spot, Morrow isn’t a stranger to hard work. 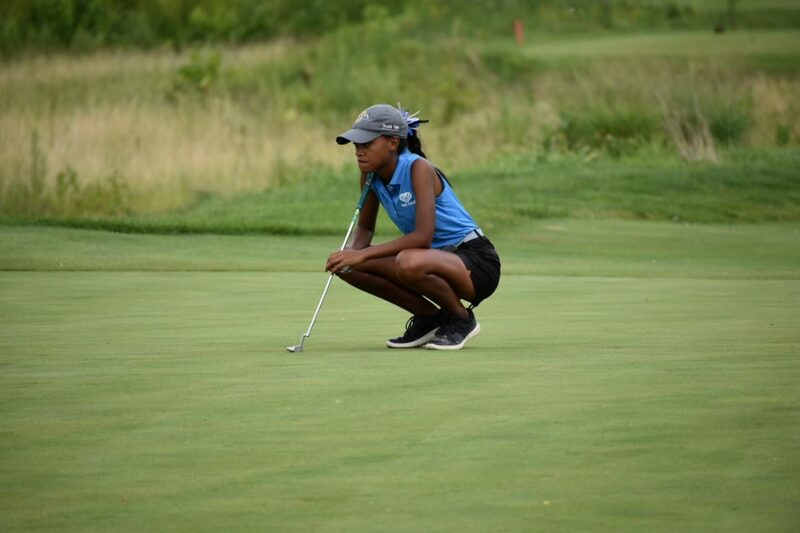 It’s not unusual to find Morrow on the driving range or the golf course for three to four hours at a time, while she could be spending that time with her friends or on school work. Morrow even sacrificed attending her Junior prom in order to practice for a tournament. However, she wouldn’t change a thing. “If I wouldn’t have been out there practicing, I don’t know if I would’ve been this good” she says. “It’s really just golf [that defines me]. I spend a lot of my time golfing and practicing because I’m going to use that for my future. Golf has helped me realize more of what I want to be in life” Morrow says. After graduating, Morrow will attend Indiana State University to play golf. She also hopes to become a dentist or have any job aimed at helping people in need. Morrow credits her love of helping people to golf. She has learned respect, encouragement and collaboration through meeting people in new settings and the etiquette rules on the golf course. Despite her ranking and continuous impressive accomplishments, Chelsea doesn’t let that get to her head. Along with making it to State, one of the things she is most looking forward to this season is the team bonding. It’s her last year of high school, and she wants to make the memories count. Last year at Regionals was Morrow’s favorite memory in all of her years of playing golf. The team made it to State after playing highly competitive schools and being unsure about their fate. “Just knowing that we made it as a team made us really excited that we finally accomplished it and that together we could go to state” she says. Morrow is hopeful that the team’s constant improvement will allow for another State run this season. Golf requires diligence and patience, something that Morrow has applied to her life off the course as well. “In life, you can have ups and downs. Not everything’s going to be perfect all of the time” Morrow explains. “When you play golf it’s not all about how big you are, how much muscle you have or how tall you are. If you can shoot good scores then you can be number one”. Chelsea will keep this mindset throughout her life and her future endeavors. “[Being number one] feels good knowing that spending hours on the golf course has really paid off because now I’m showing how much hard work I’ve put in. I’m really proud of everything I’ve done”.